CTS developed the structural design for these futuristic-looking, solar-powered charging stations that are starting to appear in Washington, Oregon, and other parts of the U.S. 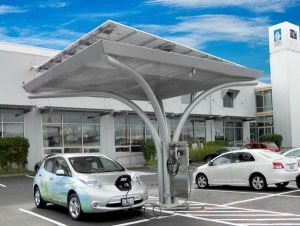 The maker of these solar-powered charging stations (EV4 Oregon) is using CTS’s services exclusively to design the reinforced-concrete foundations, the elegant steel columns, and the roof frame that supports the solar panel array. The photo illustrates a recent installation constructed in Seattle. This installation includes battery storage technology and a smart-grid interface that will allow the charging unit to store solar power for future charging needs and offset grid demands. After designing two prototypes for differing wind-load conditions, CTS coordinated with the manufacturer to provide a design that eliminates the need for all onsite welding, and allows for assembly and transport of the roof frame in two pieces to the site. This minimizes the erection time on the site for all future units.